On September 22nd 2007, in the evening of the 12th tournament day, the former sekiwake Takanowaka finally decided to hang up his mawashi. He had never managed to return to his former level of combined strength and technique after the serious knee injuries that he suffered at the top of his form in 2003. The retirement ceremony will take place on February 16th 2008 in the Kokugikan. Yuki Ozaki, as is his real name, was born on April 2nd 1976, son of a local professional baseball player. Young Yuki Ozaki was not predestined to become a professional sumo wrestler from his early childhood, but, instead he intensely trained at baseball in order to follow in his father's footsteps. Baseball was not his only interest, since a passion for playing the piano, which he would polish to perfection with aid of his teachers, also awoke in him. In secondary school, being taller than his comrades, he became the driving force of the school's basketball club; he was so successful that several private high schools offered him scholarships to join their teams. As you can see, Yuki Ozaki was an exceptional athlete, endowed with his father's large build. One afternoon, at the invitation of his school's sumo club manager, he tried sumo and inflicted a withering 14-1 on the club's regulars. The trainer, who had close ties with Naruto-beya, informed the former yokozuna Takanosato that he had a choice recruit for him who could make a splash. Yuki's mother and grandmother determinedly opposed the entry of their little darling into professional sumo, but Naruto oyakata managed to achieve his goal, and Yuki Ozaki became a member of Naruto-beya in March 1992, at the same time as a certain Shinobu Kogawa, the future sekiwake Wakanosato. 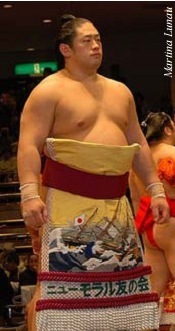 At the time of his debut with the shikona Takaozaki, he was 16 years old and 187 cm tall and with only 80 kilos, he lacked the power and technique to assert himself. It would take him seven long years to build the body of an adult sumo wrestler, and he became a sekitori in Natsu basho 1999. From then on, he was called Takanowaka and carried 131 kilos on a 190 cm frame. At the height of his form, when he was a sekiwake, his weight reached 152 kilos and he had already won two fighting spirit prizes as well as a kinboshi over yokozuna Musashimaru. After the injury, in spite of the painful knees, he managed to show a glimmer of promise now and then, but the constancy was gone. The determination alone did not suffice any more - such a pity!